Everyone has bad hair days. It might be the weird weather that makes your hair frizzy every now and then. Maybe you got bad cuts from stylists who had no idea what they were doing and now you’re stuck with your tragic hair until it grows long enough to cut again. Whatever the reason, bad hair days are inevitable and impossible to hide. You can avoid less than perfect hair by getting the right cut for your hair type and face shape. Go to a salon with hair experts who have various strengths, and you can consult them for the specific 'do you're digging at the moment before you go ahead with your reinvention. And whether you're unsure of what you want for your hair or you know exactly what your next hairstyle should look like, you should know that when it comes to getting a haircut that looks absolutely perfect for you, your stylist is very important. Be familiar with his or her styling strengths to ensure you get great service and the most gorgeous look ever--that suits you--at all times. Back in October 2009, Cosmo gave you the lowdown on Acqua Salon's fabulous hairstyling packages, one for every look you want to achieve--specifically those who are channeling Divas, Rockstars, or even Goddesses. Aside from these style packages for various styling preferences, Acqua actually has stylists with specific strengths. Get to know which stylist can best help you achieve the look you desire in 2010. Stylist Terry Aquino is your woman because sophistication is her styling trademark. She’s all about fresh and classy looks. Five years' worth of experience have shown her to be an involved and caring hairdresser who only recommends the very best for her clients. You need to see Acqua hairstylist Narry Naraja. His signature looks are always glam, but still functional for daily wear. He’s so meticulous about his cuts that he works with five kinds of scissors to make sure your hair is cut to perfection. His ten years of experience will ensure you he'll only style your hair according to what suits your face shape. Naraja’s forte are short ‘dos and long, gorgeous layers. Are you one of those fashionistas looking for a stylist who will push your hairstyle to the limit? With 12 years of high fashion and runway experience under her belt, Laila Ramoran is your go-to girl for cutting edge styling needs. She’s definitely a stylist for the more adventurous! She has a passion for beautifying people and customizes your look based on your face shape, your style, and your personality--a practice employed by many of the best foreign hairstylists. If you’re not in the mood for a cut but still feel like pampering your locks, Acqua has other ways to make your hair look great--with services ranging from basics like shampoo and blow dry (P220) to specialized services like perms (starting at P1,500), hair relaxing (P1,500), rebonding (P4,500), coloring (P1,700), cellophane (P1,200), and healthy hair care treatments (starting at P500). So go, get gorgeous! 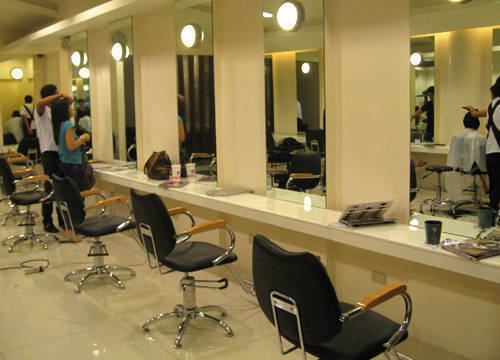 Visit Acqua Salon at 2/F, Mindanao Wing, TriNoma Mall (916-7558). See Acqua's hair services menu on the next page.